Living and renting in Dubai can be a prospect which is both exciting and at the same time a bit daunting if you are new to the city. However, the experience of living in Dubai is one to be embraced. The Emirati culture is interesting and diverse, developed from a rich history and influences from many nationalities that call Dubai home. One of the key factors in deciding where you want to rent is what kind of lifestyle you want. Do you want the convenience of being close to your place of work or are you happy to live outside of the city centre and commute every day? Are you looking to rent in one area for a while or are you likely to move around on a regular basis? Are you looking for an apartment, a villa, or just a place to ‘rest your head’ between travels? So, what does community living in Dubai mean? Although the UAE has recently been rated the second safest country to live in in the world (behind Iceland) the safety of your family is still paramount when you are choosing somewhere to rent. Entry to communities is limited to residents and their visitors, as access is monitored and controlled by guards and electronic cards which keep trespassers away and creates a secure environment. Communities come with the added benefit of a range of amenities and fitness facilities. These can include state-of-the-art gyms, large outdoor pools, basketball courts and of course play areas for the younger members of the family. Although pretty much every corner in Dubai has a local convenience store, the weekly shop would normally involve a drive to the closest mall with a supermarket. Community centres provide residents with access to amenities such as onsite supermarkets, pharmacies, and much more, right at your doorstep. Communities are perfect for families as your children will have access to a new group of playmates from day one. The community lifestyle and shared amenities also mean that you are more likely to get to know your neighbours and even meet new friends. Not only do communities give you the benefit of your own personal outdoor space, be it a balcony or garden, but they are also a greener environment as they are beautifully landscaped providing a retreat away from city living. Green space is at a premium in Dubai so having ready access to parks and dedicated outside play areas is a real luxury. 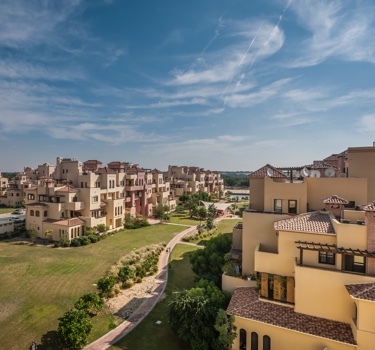 Perhaps the most tangible benefit of Community living in Dubai is that it encourages social interaction among residents. Community living in Dubai gives you the opportunity to take part in locally organised events such as open-air film screenings, children’s parties, and have a sense of belonging. Being part of an established community means you are more inclined to create a homely environment where you are quite content to spend the weekend chilling in the garden - or even invite the neighbours around for a BBQ. Most communities in Dubai have active groups on social media where you can ask for recommendations for the best gardener or raise suggestions to improve day to day life in the neighbourhood. This support network can be invaluable in making your life easier and as these groups have administrators you can be assured that your voice will be heard and any concerns you may have are addressed. Whether the lifestyle you choose is one in a community or in the middle of the bustling city, renting and living in Dubai can be a great experience and you'll leave a better person than when you arrived.